Today’s special on the menu, Baked Moong Dal Gujiya orKaranji and Thandai. Gujiya and Holi are just two different names of the same thing, ‘Happiness’. Holi is the Indian festival of colours to celebrate the happiness. It is also celebrated to welcome spring which also represents colour and youth by the way. And who wants to double up their happiness? Raise your hands. Let me lend you my Baked Moong Dal Karanji/Gujiya for this Holi to enjoy the fun of Holi to the core this year. Bake these gujiyas now and you can always thank me later anytime. Happy Holi to all who are celebrating! I know you all love Karanji but who likes to spoil the fun part by spending the time in kitchen to fry gujiyas? None! This year I have baked these Moong Dal Gujiya already yesterday and also stored them properly. 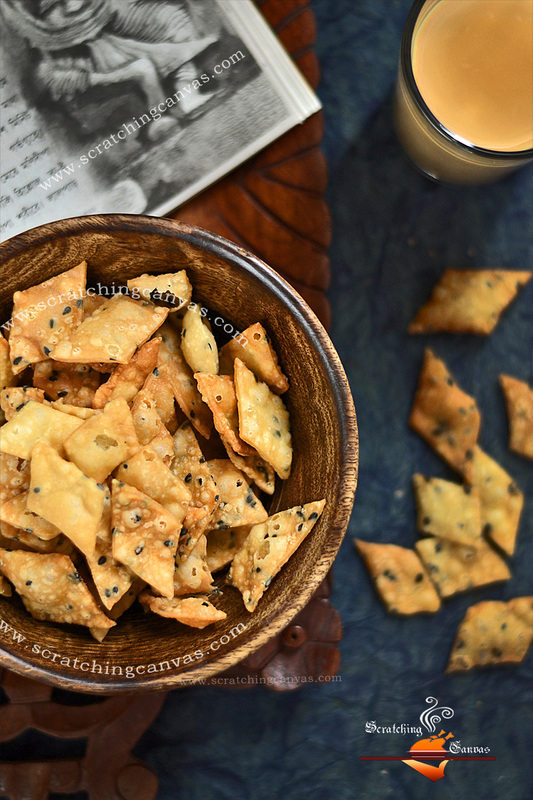 They are crunchy, crisp and very lightly sweetened but the biggest reason to be happy is no gallons of oil for frying, very little gheewill do the trick for baking. Now I’m all set, if I can manage to save them till Holi. For those who has no idea what Gujiya or Karanji is, let me clear the air for you, It is an Indian dessert dumpling which is very popular in North, Middle & West part of India. This is shaped as half-moon and a round, full moon like. The half-moon shaped are known as Chandrakala and full round are known as Suryakala. Like many other desserts it is also a deep fried one. 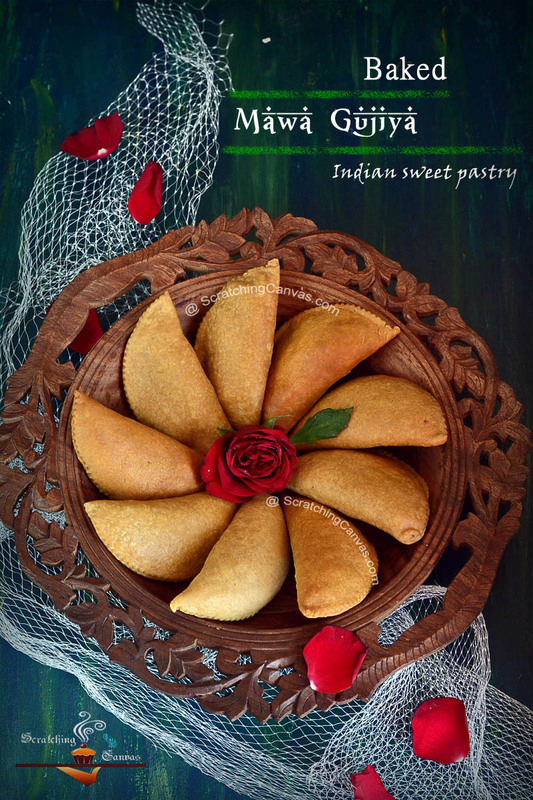 The outer shell pastry is made of flour and ghee; stuffed with different filling. Most popular stuffing is of mawa (khoya) and dry fruits. Sometimes moong dal, poppy seeds, semolina are also used as stuffing. I’ve already shared the recipe of Baked Mawa Gujiya/Karanji to serve with Thandailast year. This year I’ve picked Moong Dal Karanji/Gujiya recipe to recreate in my kitchen. Here is the detailed recipe of BakedMoong Dal Gujiya or Karanji. I used my microwave version of Homemade Khoya/Mawa for this recipe. I dint have enough patience for glazing as I was Hungry. But if you have time in hand, I will insist you to do it. You can use either homemadeor store bought khoya/mawafor this recipe but remember the khoya/mawa needs to be fresh and moist but definitely not watery or dry. Cover the dough with cling film and allow it to rest for 30 mins to overnight in refrigerator. (I always keep overnight unless I’m in hurry). After the resting period the dough will be pliable comfortably. (See Tips)Now use the dough whenever you are ready to bake. 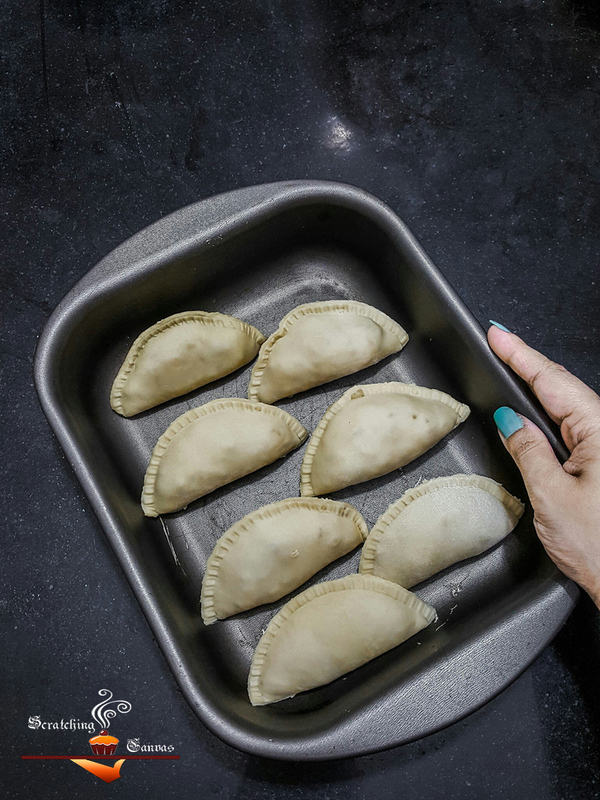 Place all the gujiya in a greased (use reserved ghee) baking pan and arrange in a single layer. Brush them with ghee/butter/oil and put in a preheated (1800C) oven. Bake the gujiya at 1800C for 20-25 mins (depending on the oven). If you are using the top shelf then you don’t need to turn them in between else take them out and turn them after 10-12 mins once to achieve the even golden brown color. Once done, remove the pan from oven and keep on wire rack to bring to room temperature. Baked Moong Dal Gujiya or Karanji is all set to serve fresh. It tastes best when served at room temperature. Arrange the excess Baked Mawa Gujiya or Karanji in any air tight container and store at room temperature. I never refrigerate my Baked Gujiyas. They will taste same (as good as fresh) for more than 15 days (mine never last more than that) at room temperature. 1. Use dry fruits of your choice; there are no rules & regulations. 2. Use rose water to enrich the flavour. 3. Create some variations with, roasted semolina and/or poppy seeds. 4. Substitute sugar with jaggery. 5. Finally, you can always deep/shallow fry them instead of baking; only if you insist. 1. Substitute the sugar with equal amount of condensed milk or sugar free powder. If you’re using sugar free then add it towards the end of cooking not at the beginning. 2. 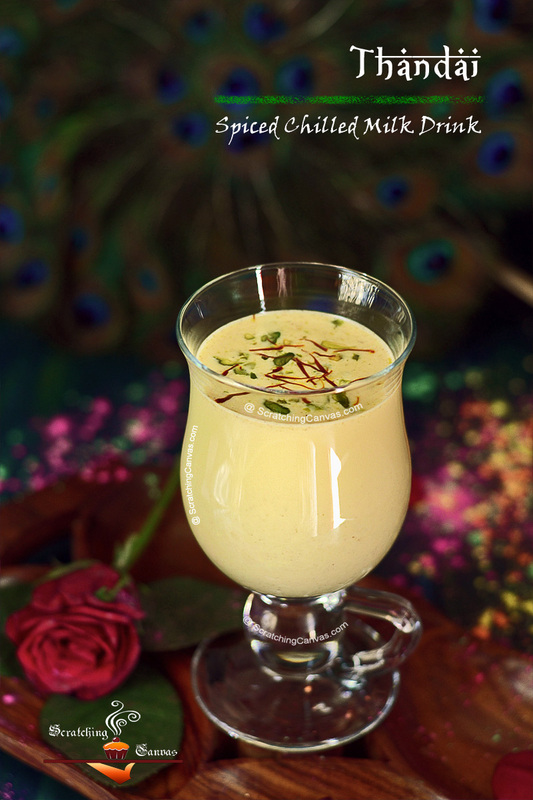 Use 1/4thto ½ cup ghee for smoother and richer taste. I dint want to pile on extra weight so I use as little fat as possible. 3. If you are using salted butter for kneading the dough, omit the salt specified in ingredients. 4. If you don’t mind excess ghee in your food, add 1/4th cup of ghee. 5. Moong dal is sticky and it will stick to the pan. So don’t worry and keep stirring. Do scrap the sides off occasionally to prevent burning. 6. Add ghee at the end only if you are not using 1/4th cup ghee in the beginning. Adding dollop of ghee at the end will ensure to keep the mixture moist and soft. 7. While mixing ghee (or butter) and flour, be careful to mix thoroughly. It is important to coat the flour with the fat to restrict the gluten to develop. 8. Once wet ingredient is added to the mixture, don’t over mix things. This will lead to stiff dough. 9. It is important to keep the dough covered with cling film to avoid dry stretchy dough. 10. You can also use any moulds of your choice. Or you can also use cookie cutter to create exciting shapes. 11. If you leave the dough in open air while you are working with small balls, it will lose its moisture and will become too dry to handle. 12. The glazing will make Gujiya sweeter so if you prefer less sweet gujiya reduce the amount of sugar sweetener in stuffing.